Lovely hotel, friendly staff, and great accommodations. Parking can be a challenge. Close to all of the must see sites, bus stops, and tram. We will be back! Where to find Glyfada hotels near an airport? Where can I find hotels in Glyfada that are near tourist attractions? 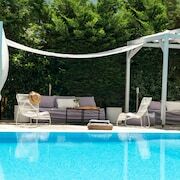 From the cheap and cheerful to the more exclusive, Glyfada offers a generous assortment of quality hotel and apartment choices. If you are after accommodation within 0.1 kilometres (0.06 miles) of central Glyfada, Expedia's hotel database lists 50 apartments and hotels that meet that criteria. 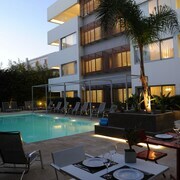 Glyfada's center is a short stroll from hotels like Brasil Suites Hotel & Apartments and Blazer Suites Hotel. Are you looking to identify cheaper accommodations? 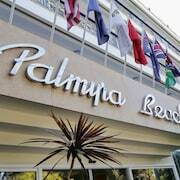 You might like to investigate the Oasis Hotel Apartments, Hotel Palmyra Beach and Best Western Hotel Fenix. 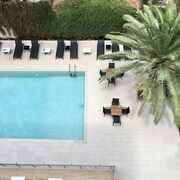 Check out the Grand Resort Lagonissi or the Hotel Grande Bretagne, a Luxury Collection Hotel, Athens. The Grand Resort Lagonissi is 16 kilometres (10 miles) from downtown Glyfada. The Hotel Grande Bretagne, a Luxury Collection Hotel, Athens, is located 11 kilometres (7 miles) away. Some other places to stay are the Cape Sounio, Grecotel Exclusive Resort and the King George, a Luxury Collection Hotel, Athens. The larger Greek Mainland area is certainly well worth seeing as well. Greek Mainland has beaches and coastal plains. Commonly visited Greek Mainland tourist sites are castles, traditional villages and old towns. Visitors and locals alike in this region of Greece can enjoy snowboarding, skiing and mountain biking. Syggrou is 10 kilometres (6 miles) to the northwest of Glyfada and is where you'll find Onassis Cultural Centre and Tomb of Heinrich Schliemann. The Nina's Athenian Loft and AVA Hotel & Suites are just some of the fabulous Expedia-listed lodging options in Syggrou. Or stay in Exarhia, 13 kilometres (8 miles) to the north of Glyfada, where you can choose from the Electra Palace Athens and New Hotel. The Museum and Study Centre of Greek Theatre and Fournos Theatre are popular places to see when visiting Exarhia. If sport is a favourite pastime, take the time to visit Athens Olympic Stadium, which is 18 kilometres (11 miles) to the north of Glyfada. 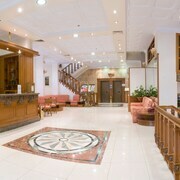 For tourists who are keen on booking a room close by, make a reservation in the Hotel Pentelikon or Semiramis Hotel. For visitors arriving by air, Eleftherios Venizelos Airport is the preferred airport for Glyfada. Not far away is Sofitel Athens Airport. 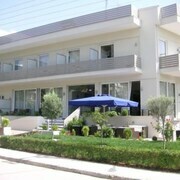 What are the most popular Glyfada hotels? Are there hotels in other cities near Glyfada? 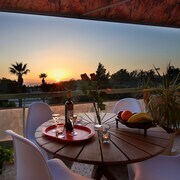 What other types of accommodations are available in Glyfada? Explore Glyfada with Expedia.ca’s Travel Guides to find the best flights, cars, holiday packages and more!